The CP88 feels like it’s been designed by players, for players. It might not be red, but this is a stage piano that has a bright future ahead. A versatile high-quality soundset for the gigging musician. We’d have liked to have seen a matching stand. The clue’s in the name. A stage piano is something that you’re going to be seen with and is, you might argue, a reflection of the kind of player you want to be seen as. We wouldn’t go quite as far as to say that it’s an extension of who you are - we’ll leave that kind of histrionic talk to the guitarists - but there’s certainly a perception issue here. This is where Yamaha has been presented with a problem in recent years. Yes, it has produced some fine and functional stage pianos, but other manufacturers - notably Nord - have gained a reputation for building the live keyboard instruments du jour. Go to a festival or watch any kind of live music television and the chances are that it won’t be long before you see one of their bright red beauties popping up, and this represents the kind of branding that money can’t buy. It’s into this climate that Yamaha is launching its new CP pianos, the name being a reminder that Yamaha themselves have a pretty strong pedigree in the electronic piano market. Anyone who’s heard a Phil Collins record will be familiar with the seductively synthetic tone of the classic CP pianos, the sounds of which have come into favour again in recent years. There are two models in the new range - the CP73 and the CP88 – and it’s the larger of the two that we’ll be considering here. Aside from the number of keys (73 and 88, in case you hadn’t worked that out) the pianos are functionally very similar, though there is some difference in the keybed, which we’ll get to later. The CP88 weighs in at 18.6kg, which is pretty reasonable for a piano of this size. The box is big and awkward, as you’d expect, but it’s just about a one-person job to move it, and we managed to lift the CP onto a stand without much trouble. As such, it ticks an important box for gigging players - it’s reasonably portable - though it would have been nice to see a matching stand included. Build quality is impressive, too. As we’ve already mentioned, Yamaha has been making instruments like this for many a long year, so they know a thing or two about putting them together. The case is made from aluminium, which helps to keep the weight down, and the CP feels durable and well set for life on the road. Another box ticked, then. First impressions of the interface are that it’s simple, clean and well thought out, with a couple of subtle touches immediately catching your eye. Firstly, there are the yellow, red and green rocker switches that are used to scroll through the instrument variations in the Piano, Electric Piano and Sub sections - a nod (we assume) to Yamaha’s classic CS-80 synth, and another reminder of the company’s illustrious past. You’ll also notice the metal switches that are used to turn each of the aforementioned sections, and also the master Delay and Reverb, on or off. There’s definitely a vintage vibe here, and the CP88 wears it well. One slight criticism is that, when you need to make hands-on tweaks at speed, the subdued, one-colour interface can make it a little difficult to see where one section ends and another begins, and this problem is exacerbated in low-light conditions. We like the subtle styling, and the lights round the knobs make assessing current level settings easy, but a more obvious visual separation of sections would’ve been welcome. That said, the CP88’s control setup is actually one of its key selling points, giving you one-to-one access to all of its key features. There’s no menu diving here, with each dial, switch and button being clearly labelled. Assigning keyboard splits and adjusting octaves is all very self-explanatory, and you may never even need the manual. You know where you are with the CP right away. You can use each of the CP88’s sound generation sections on its own, but if you want to create monster patches that combine Piano, Electric Piano and Sub tones - as well as the Delay and Reverb effects - Live Sets are the way to go. These are accessed via the panel of buttons to the left-hand side of the interface; there are eight selector buttons, plus a further two to let you navigate the 20 pages. You can also zip through the stored Live Sets quickly by turning the push button encoder. A wide range of Live Sets comes included, with some featuring just one sound, and others a full stack. These do a fine job of demoing the CP88’s capabilities, and can be adapted to taste (you can see which sounds are coming from each section via the display). Storing, copying and moving Live Sets is simple. What’s more, there’s Seamless Sound Switching between them, meaning that you can select a different Live Set while the previous one continues to be heard. This is another useful performance feature, and will come in particularly handy when you need a fast patch change between songs. To the sounds, then, and the obvious place to start is with the acoustic grands. Yamaha have gone all in here, giving you emulations of not just its own CFX and S700 models, but also a Bösendorfer Imperial 290. Like all of the sounds here, they’re powered by Yamaha’s AWM2 sampling engine, and they cover all the necessary grand piano ground. The CFX and Bösendorfer are great if you want a big ‘classical’ sound, while the S700 works particularly well in a pop/jazz setting, cutting through nicely in a mix. As with all the sound sections, there are dedicated Volume and Tone knobs and dedicated effects - these vary from section to section - and you can switch on the Damper Resonance function for realism. It must be said that the playability of all these pianos is helped by the superb keybed. This is Yamaha’s Natural Wood, Graded Hammer, triple-sensor keybed, which also boasts Synthetic Ebony and Ivory Key Tops (the CP73’s keyboard has an electric piano-style ‘balanced action’). It looks and feels fabulous, responding superbly and handling fast runs with ease. There’s something extremely rewarding about the way this handles, almost to the point that it makes you feel like a better player than you actually are. There’s more acoustic piano goodness in the uprights section, which features Yamaha’s U1 and SU7 models. As you’d expect, there’s an excellent CP80 emulation here, too, and the Pianos section is rounded-off by some layered piano/strings sounds for big ballad moments. Move to your right and you’ll find the E. Piano area, which gives you three flavours of Rhodes (76 Rd, 75 Rd and 73 Rd), Warm and Bright Wurlys, Clavs, a harpsichord and - of course - several varieties of DX piano. These can all be clean and polite or filthy and funky - a Drive control and some excellent modulation effects are particularly useful when you need to dial in the dirt. Even if you can’t play like Stevie Wonder in his ’70s pomp, you’ll have the sounds in your arsenal to make you wish that you could. The final sound section, Sub, covers everything else, including pads, strings, a variety of organs, chromatic percussion and a selection of synth sounds. These are all perfectly serviceable, if not showstoppers. Again, the effects are the ones you want to see - a rotary speaker emulation, distortion, tremolo and chorus/flanger. Speaking of effects, the Master Delay is worth a special mention, giving you a lovely warm analogue variant and a crisp digital algorithm. For both this and the Reverb, you can adjust the send levels individually for each sound section. A master EQ, which works globally, completes the control panel. The CP88 is a genuine one-stop stage keyboard solution, but if you do want to bring a second keyboard into the mix, the L/Mono and R audio 1/4-inch jacks give you an easy way of doing it, potentially eliminating the need for a mixer. A Gain knob enables you to adjust the volume balance. Other connectivity options include balanced XLR L/R outputs, unbalanced 1/4-inch outputs, and a 1/4-inch headphones socket. You can plug in a sustain pedal and a further assignable footswitch, with two further Foot Controller inputs letting you control Expression, Wah, etc. MIDI I/O comes on standard ports and over USB. A further USB Device port means you can load and save data to a flash drive. As we implied at the start, the CP88 has some serious competition, and you could argue that, when set against the Nord Stage 3, it does fall short in some areas. It can’t rival the Nord’s A1 Synth Engine and user sample import, and the organ section isn’t as comprehensive, either. If you simply must have drawbars - physical or digital - the CP isn’t for you. But there’s something about the CP88 that just makes you want to play. It passes the Marie Kondo test in that it sparks joy when you sit down in front of it, and that has everything to do with the one control per function interface and logical layout. By paring things down to the essentials, Yamaha has made less feel like more. 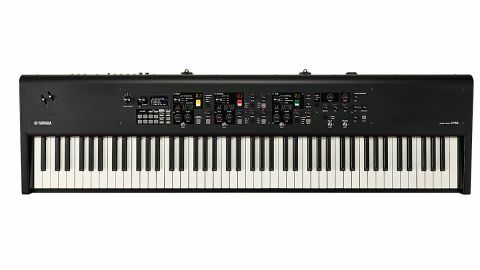 In the UK, the CP88 can be had for nearly a grand less than an 88-note Nord Stage 3 - and a couple of hundred quid less than the Nord Piano 4, too - and the price disparity in the US is even greater. Yes, there are other options to consider - the likes of Korg’s GrandStage 88 or Roland’s RD-2000 - but the CP is right there in the mix.